In this article I seek to show that, while the Ryukyu shobun refers to the process by which the Meiji government annexed the Ryukyu Kingdom between 1872 and 1879, it can best be understood by investigating its antecedents in the Bakumatsu era and by viewing it in the wider context of East Asian and world history. I show that, following negotiations with Commodore Perry, the bakufu recognized the importance of claiming Japanese control over the Ryukyus. This study clarifies the changing nature of Japanese diplomacy regarding the Ryukyus from Bakumatsu in the late 1840s to early Meiji. 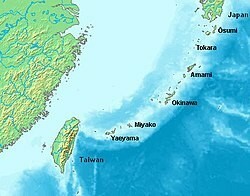 The Ryukyu Islands are a chain of Japanese islands that stretch southwest from Kyushu to Taiwan. 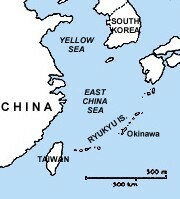 The former Kingdom of Ryukyu was formally incorporated into the Japanese state as Okinawa Prefecture in 1879. From the end of the fourteenth century until the mid-sixteenth century, the Ryukyu kingdom was a center of trade relations between Japan, China, Korea, and other East Asian partners. According to his journal, when Commodore Matthew C. Perry demanded that the Ryukyu Islands be opened to his fleet in 1854, the Tokugawa shogunate replied that the Ryukyu Kingdom “is a very distant country, and the opening of its harbor cannot be discussed by us.”2 The few English-language studies3 of this encounter interpret this reply as evidence that the bakufu was reluctant to become involved in discussions about the international status of the Ryukyus; no further work has been done to investigate the bakufu’s foreign policy toward the Ryukyus between 1854 and the early Meiji period. In what follows, I compare American sources with Japanese documents to show that in 1854 the bakufu did not define the Ryukyus as a “country,” that is, as a state completely independent from Japan. More importantly, I point out that during negotiations with Perry, the bakufu’s understanding of the status of the Ryukyus was very similar to that of the Matsumae domain in Hokkaido, which the bakufu considered a territory under the authority of the Matsumae clan. In short, the bakufu never used the word “country” to describe either the Ryukyus or Matsumae and it deliberately defined its relations with these distant territories in ambiguous terms in order to deter interest by foreign powers. According to earlier studies by Japanese scholars,4 sometime between Perry’s first visit to Japan (1853/6/3 to 6/125) and his second (1854/2), the head of the shogunate’s senior councilors, Abe Masahiro, drafted guidelines outlining answers to possible questions about the Ryukyus’ political status to be used in negotiations with Perry on his return to Japan. This manual, which unfortunately lacks a precise date, is an extremely important document which shows that Abe intended to claim that the Ryukyus were under the political authority of both China and Japan. It is clear that Abe recognized that the Ryukyuan issue would arise during negotiations with Perry and since bakufu officials had told Perry that the Ryukyus were “very distant,” the shogunate apparently would not assert itself as a controlling power over Ryukyu. As a result, previous studies have characterized bakufu policy toward the Ryukyus in 1854 as a passive one that did not significantly influence subsequent events. This entry was posted on Tuesday, September 18th, 2018 at 00:05	and is filed under Uncategorized. You can follow any responses to this entry through the RSS 2.0 feed. Both comments and pings are currently closed.